This page is an in-depth study of pins in chess. We start with the basics and later we move on to the advanced aspects of pin tactics. Pin Tactic: 1.Bb3 pins the black queen to the king. The queen can’t leave the a2-g8-diagonal, else her king would be in check. What is a pin tactic? What is a relative pin? What is an absolute pin? What is a cross pin? What is a situational pin? What is the difference between a pin and a skewer? What is a pin in chess? A relative pin is a when the value of a pinned piece is relatively lower than the piece behind it. Black plays 1… Bf6 and pins the white knight on c3. It is a relative pin because moving the knight would expose the higher-valued rook on a1. In the case of a relative pin, the pinned piece could still freely move – but it’s usually not a good idea because it would expose a relatively higher-valued piece behind it. In the case where a piece is pinned to the king, it is illegal for that piece to leave the file or diagonal that it is pinned on, else this would leave the king in check. White plays 1.Bg3. This is an absolute pin on the black queen since it would be illegal for her to leave the a2-g8 diagonal. In other words, if a piece is pinned to their king it is referred to as an absolute pin. When a piece is pinned from two directions, it is referred to as a cross-pin. 1.Bf4! Black’s bishop on e5 is pinned in 2 directions. On the e-file it is a relative pin, but on the b8-h2 diagonal it is an absolute pin. The best black can do is 1… Bxf4 2.Rxe8+, which loses a rook for a bishop. In many cases a pinned piece could actually still move along the rank or diagonal it is pinned on. The diagram illustrates that even though black’s queen is technically in an absolute pin – she can still legally move on the b8-h2 diagonal. When a pinned piece still has limited movement, such pin is referred to as a “partial pin”. White’s rook on c1 places the black knight in a situational pin. 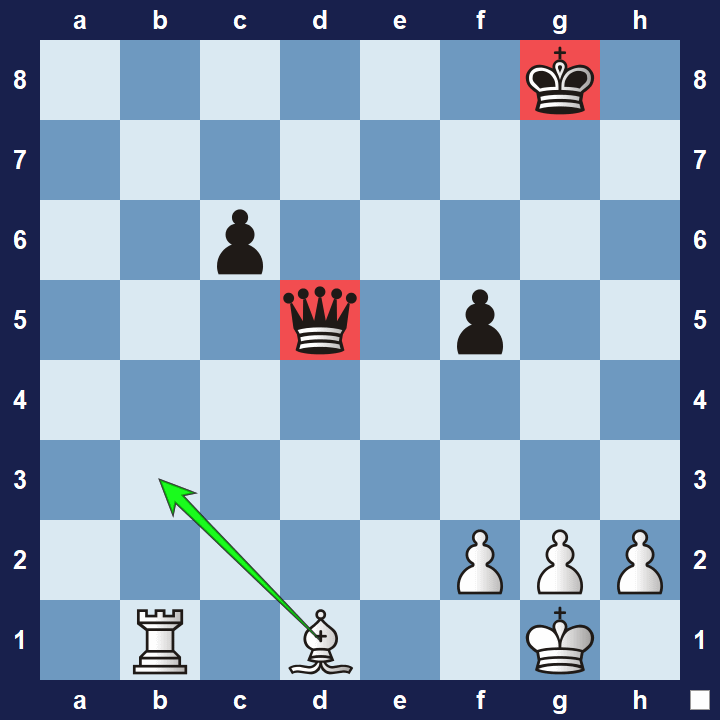 Moving the knight would allow 2.Rc8+, winning even more material. A situational pin is usually a bit more difficult to spot because the consequences of moving the pinned piece is not as obvious as is the case with a relative pin or an absolute pin. Before we continue with the study on pin tactics, I want to explain the difference between a pin and a skewer. At a first glance they appear to be quite similar but their effect on the position is usually very different. In the case of a pin, the pinned piece has a lower value than the target behind it. But in the case of a skewer the piece at the front in the line of attack has a higher or similar value to the piece behind it. The diagrams below will illustrate the difference between a skewer and a pin. Black’s knight on f6 is pinned. A common pin. The black queen is in a skewer because her value is higher than the rook on a8. Note how the effect of the ordinary pin is usually not as dangerous as the skewer. In many cases, although not always, a skewer is more powerful than a pin. This is because in the case of a skewer the threat is always immediate, whereas in the case of an ordinary pin your opponent usually has more time to deal with it. Pin tactics are one of the most common tactical patterns in chess. In fact, you will hardly ever see a game where pins did not play a role at some point during the game – which is another important reason to study them. The power of pin tactics inspired the chessmaster, Fred Reinfeld, to coin the phrase: “The pin is mightier than the sword,” which is of course a word-play on “The pen is mightier than the sword”. You can reduce the current value of your opponent’s piece. When you pin a piece, it’s usefulness can be significantly restricted. The pinned piece cannot perform as it should because moving it will expose another target. You can limit your opponent’s defensive resources. A pinned piece is usually a weak defender. In fact, a pinned piece often has little or no effect on the squares it is supposed to defend. You can increase the pressure on your opponent by attacking the pinned piece. In some cases you can even win material if you can bring enough pressure to bear on the pinned piece. Only the long range pieces (queen, rook and bishop) can create pins. Interesting fact: In an endgame position with only kings, pawns and knights on the board, pin tactics aren’t possible. 1. Bd5 uses a bishop to pin black’s queen. Note that a pin is usually much more effective when the pinning piece (white bishop on d5) has a lower value than the piece it pins (black queen on e6). For example, white could also create a pin by playing Qd5? but it wouldn’t be effective since black could simply exchange the queens. White’s move, 1.Rd1, uses a rook to create a pin tactic on the d-file. There are two black targets present on the d-file, making them vulnerable to a pin tactic. The black Rd8 is undefended. This is an important bit of detail since after white plays Rd1, moving the Bd7 will result in black losing the Rd8. There is already tension between the white and black bishops. By pinning the Bd7, white will win it on the next move. 1.Qd5 creates 2 pins at the same time! The knight on c6 is pinned to the rook on a8, whereas the bishop on d6 is pinned to the black queen. This example shows why the queen is such a powerful piece, 1.Qd5! makes numerous powerful threats at the same time. Black’s Ra8 and Qd7 are both undefended. Undefended pieces are more vulnerable to tactics since moving the pinned piece will lose the piece behind it. The black Nc6 and Bd6 are only defended by high-value piece (the queen). Pawns are the most effective defenders of your pieces. This example shows why high-valued pieces are not ideal defenders. White’s queen and bishop works together to pin the knight on e5 to the g7-square (checkmate threat). The exposed position of black’s king makes him a primary target for possible tactics. The black Ne5 is only supported by a high-value piece. Pieces that aren’t defended by pawns are more vulnerable to tactics. The better development/activity of the white bishops means tactical combinations are more likely to work out for white. Below are a few examples illustrated in their simplest form, but they can be used in more complex situations too. A pinned piece is often more vulnerable and so it makes sense to attack it, if you can. 1.e5 attacks the pinned knight on f6. On the next move white will capture the knight with their pawn instead of the bishop. By definition, pinned pieces can’t move without exposing another target. Therefore it makes sense to increase the pressure on a pinned piece – by attacking it, if you can. A pinned piece is a poor defender and you should aim take advantage of it. Black’s bishop on e7 is pinned. White can take advantage of this pin by playing the move 1.Nd6! which forks the black queen and rook. At a first glance the d6-square seems to be defended by the Be7. However, Be7 does in fact not defend the d6-square due to the pin by the Re1. Even when a pin does not exist yet, the threat of creating a pin can in itself be a useful weapon. 1.Rxe6! This move wins the bishop since if black respond 1… fxe6 (which clears the f-file in front of black’s king), then white can pin black’s queen with the move 2.Rf1! In chess, a threat is sometimes more useful than its execution. In the above example, white didn’t make an actual pin, but used the possibility of the pin (the threat) to achieve another objective (winning material). It’s great when you can use pin tactics on your opponent, but what to do when you are on the receiving end of a such tactic? Ideally you should have anticipated the possibility of the pin tactic in the first place. Just because you overlooked the pin tactic, doesn’t necessarily mean you’re doomed. There may yet be a way out! Let’s see a few examples on how to escape from pin tactics against you. (Most of the time I use simple positions to illustrate an idea. However, these ideas often work in more complicated situations too). Black’s knight on c6 is pinned by white’s bishop. However, black can remove the knight by playing 1… Nd4! which at the same time threatens the fork tactic – 2… Ne2+, followed by Nxc1. Note: In the case of an absolute pin, the pinned piece cannot move. Therefore this escape method wouldn’t work if black’s king were on e8, instead of the rook. (It is generally much harder to escape from an absolute pin). Another way to potentially escape from a pin is if you can find a way to get rid of the piece that pins you. White’s rook on d3 is pinned by the black bishop, but white can escape. 1.Ne7+, followed by Nxf5 removes the pinning piece and saves the pinned rook. In the above example, white uses a tactical idea (fork), followed by exchanging the knight for the bishop that performs the pin. Note: After 1.Ne7+, black should play 1…Rxe7, followed by 2… Bxd3 – which results in an equal exchange of material while white escapes the pin. However, if after 1.Ne7+ black plays 1… Kh8? then 2.Nxf5 (threatening Nxg7) gxf5 3.Rxd7, white wins material. Black can escape the pin on their knight by playing 1… Nd6, which will at the same time defend the rook on e8. This is a very effective way to escape from pin tactics but you can easily overlook such an opportunity if you’re not aware of the idea. In the position below, black’s knight on f6 is pinned. Not only is white is threatening to play Nxf6+ (which would cause damage to the pawn structure in front of black’s king), but white is also threatening to exploit the pinned knight by playing d4-d5! on the next move. White is threatening 1.d5! exd5 2.cxd5 and black’s position turns bad quickly. Black can dissolve the pressure on their pinned knight by simply playing 1… Be7, breaking the pin. Black wants to prevent that white plays their d4-pawn to d5 on the next move. The best way to do this, is to break the pin on their knight by playing 1… Be7. Once the pin is broken, the knight on f6 now helps to defend the d5-square. In the last part of this study on pin tactics you get a few puzzles to test your skill. These puzzles will also serve to further improve your understanding of pin tactics in chess. We’ll start with easy puzzles and then work our way up to some advanced pin tactics puzzles. Important Reminder: Working through these lessons on chess tactics can be very taxing. I suggest you take a break and get back to these exercises when you feel the need to do so. There is no benefit in pushing yourself when you are in fact only lowering the quality of your training. The first few pin tactics will be fairly easy so that you can clearly understand the impact of a pin tactic in simpler situations. Black to move. How can you use a pin to your advantage? Scroll down to see the solution. Comment: The point here is that white’s pawn on f2 is absolutely pinned by the black bishop on b6. White to move. How can you use a pin to your advantage? 1. Rc1 wins the pinned black rook since black can’t move it away without losing the queen on f6. Comment: Since a pinned piece is usually restricted in its movement, it makes sense to add pressure by attacking it. 1. Bc6, wins the black bishop on d7. Comment: The black bishop is pinned because moving it away will allow white to play Qxd8+ (the white rook on d3 supports the white queen). On the other hand, if the bishop doesn’t move, white will simply capture it on the next move, Bxd7+. Comment: This one is quite tricky because there are pins all over the place. Even though white’s queen is pinned – black’s rook on g7 is also in an absolute pin by white’s bishop. However, by playing 1… Qd1+, black will capture the white queen on the next move, with 2… Qxg4. The point is that the white queen is absolutely pinned on the g-file, which makes 2. Qxd1 an illegal move. The next few pin tactics puzzles are a bit harder and demonstrates how pin tactics work in slightly more complex situations. White to move. How can you use a pin to your advantage? Note that black is threatening to capture the knight on d7. 1.Qe5 pins the knight on e5. On the next move white will capture it. Comment: 1.Qe5! pins the black knight (and threatens to capture it on the next move, Qxd5) but also prevents 1… Rxe7 since if black does that, white can play 2.Qe8+ Rxe8 3.Rxe8# Or if black plays 1… Rc5 to try defend the knight on d5, then again white can play 2.Qe8+ Rxe8 3. Rxe8#. This pin on black’s knight is particularly effective since the black queen on a5 is undefended. This again proves why you must be very careful when placing a pieces on an undefended square – they often become more vulnerable to tactics. 1… Qg4! followed by Bxf3+. White is helpless. Comment: It is easy to see that the pawn on f3 is absolutely pinned by the bishop on b7, yet it is somewhat harder to realise this means you can actually place your queen on g4! By training tactics regularly and by studying interesting examples, your tactical skill will improve over time. Comment: 1.Rxc5 takes advantage of the fact that the d6-pawn is pinned by the white rook on d1 but, at the same time, it also clears the d5-square so that the white bishop can play Bxc6 on the next move. 1…Qxg2 2.Qxg2 Rxe2 3.Qxc6 bxc6 wins material. Comment: After 1… Qxg2 2. Rxe2, white’s queen is in an absolute pin by the bishop on c6. Since black is threatening to capture white’s queen on the next move, black might as well give up their queen for the bishop, 3.Qxc6 bxc6. Black will reach a winning endgame position. Now we get to the advanced pin tactics puzzles. These puzzles can be very hard but it will illustrate the surprising effect of pin tactics in highly complex positions. Even if you can’t solve the puzzles on your own, it would still be helpful to you if you study the solutions. 1.d5! clears the d4-square for white’s knight. Comment: White’s move, 1.Nxd6!, exploits the fact that black’s rook on e6 is pinned in two directions. For example, if black plays 1… Rxe1, then 2.Qxf7+ Kh7 3.Qxg7# is checkmate. On the other hand, if black plays 1… Qxd6, then white can simply capture the black queen, Qxd6, and win material due to the pin on the e-file. Comment: White exploits the absolutely pinned black knight in the process in the process of trapping black’s queen. After 1.Rb4 Qf5, white can play g4 and attack the trapped queen (the rook on b4 now defends the pawn on g4). The hardest part of the exercise is to realise you can use the absolute pin on black’s knight to achieve another objective – trapping black’s queen. 1… b3! 2. axb3, followed by 2… Nd8 wins the pinned bishop on c6. Comment: Black noticed that the move Nd8 right away, fails because white can play Ba4! (moving the bishop out of the pin and defending the white rook at the same time). This is why black first plays 1… b3! (threatening bxc2) and if white plays axb3, then the b3-square will be occupied – which means the move Ba4 won’t defend the rook on c1 anymore. 1… Ne3! 2.fxe3 fxe3, followed by e3-e2. Black will find a way to exploit the absolute pin on white’s bishop. 1… Ne3! threatens 2… Rxf1# and therefore white is essentially forced to take the knight, with 2.fxe3. However, after black then recaptures with 2… fxe3, there will be nothing white can do to stop the threat of black’s next move 3… e2! Note that white also can’t play 3.Kf2 because that would be check by the black pawn on e3. I hope you enjoyed these examples of pin tactics and that you will soon get the chance to use it!